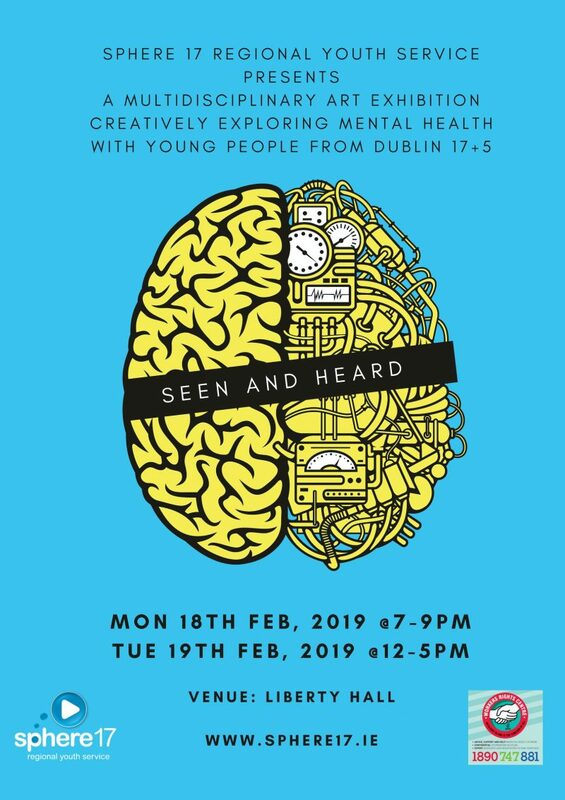 Sphere 17 Regional Youth Service would like to invite you to the grand opening of “Seen and Heard” a multidisciplinary art exhibition being held at Liberty Hall in Dublin’s city centre at 7pm. 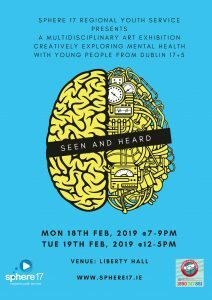 This exhibition is an exploration into the causes and effects of good and poor mental health by the young people of the Darndale, Priorswood, Bonnybrook and Kilbarrack areas. Over the course of 5 months in our 4 centres, our young people decided to take an honest and objective look at what issues effect their mental health (be prepared to be surprised!) and to present to us, their audience, creative tools that they have acquired to navigate this complex terrain. Experience the power of the creative arts to nourish resilience, facilitate expression and provide extraordinary insights into young minds. This is a multi-disciplinary art event containing Installation work, Sculpture, Drawing and Performance. Sphere 17 is a youth service based in the Dublin 17 and 5 areas working with young people from the ages of 10 to 24. The modern Liberty Hall opened in the early 1960’s. Built by the T.G.W.U as a facility for the union. The hall itself was originally a 700 seater flat floored venue on two levels with a small proscenium stage. The seats were uncomfortable fixed flip up theatre seats, and a spiral staircase that went to the balcony. The venue was mainly used for Union Meetings but plays, set dancing and bingo were regular events. The Irish Folk revival of the 1960’s found a willing home here. Copyright © 2019 Liberty Hall Theatre. Powered by WordPress. Theme: Spacious by ThemeGrill.